The new hub, called the Centre for Research and Applications in Fluidic Technologies, or CRAFT, will combine the talents of U of T microfluidic experts and NRC scientists in a bid to catalyze new discoveries and scale up production of existing prototypes to deliver higher quality patient care at a lower cost. In total, CRAFT will involve more than 200 people, 45 labs and 25 technology companies, and will be jointly funded by both partners with a $22 million investment over five years. “This partnership between the NRC and the University of Toronto will deliver a tangible impact on the lives of Canadians by developing and commercializing biomedical technologies that improve care for patients while reducing costs for the Canadian health system,” said Vivek Goel, U of T’s vice-president of research and innovation. Both U of T researchers and NRC scientists are world leaders in microfluidics, which involves mixing tiny amounts of fluid on a small chip to achieve desired chemical or physical reactions, or to grow live cells in an environment that mimics the inside of the human body. By joining forces, the new CRAFT platform – the first NRC collaboration of its kind – is expected to generate new publicly held patents and scientific publications. It also aims to bolster Canada’s medical devices and manufacturing industries, making them more competitive internationally. In particular, CRAFT will focus on using microfluidic technologies to make advances in the following key areas: shrinking the functions of medical laboratories onto a single small chip, allowing for rapid diagnosis of diseases; growing organ tissues on devices outside the body to test drugs or do research related to personalized medicine; and printing biological tissues that can be used to repair organs of the human body. “Toronto is one of the leading centres in the world for this kind of research,” says Axel Guenther, an associate professor in U of T’s Faculty of Applied Science & Engineering who is the scientific director of Toronto’s Centre for Microfluidic Systems, and one of the lead researchers involved with the CRAFT collaboration. 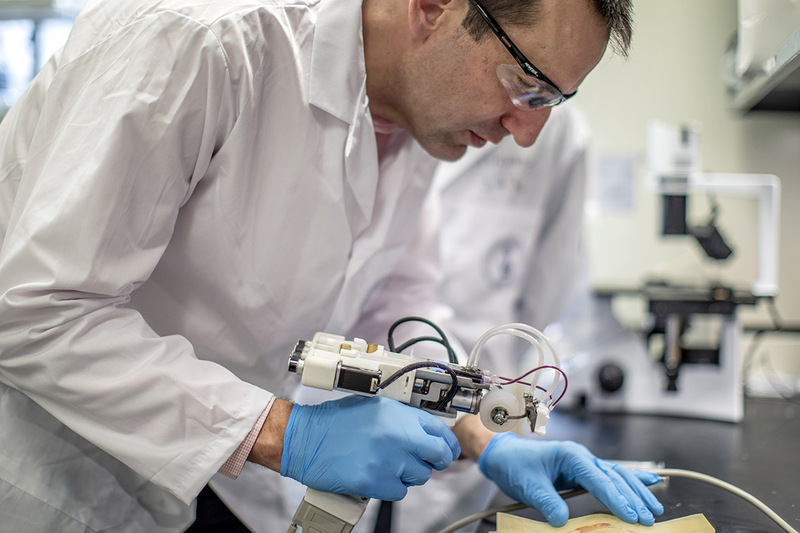 Guenther’s team, for example, used microfluidic technology to create a handheld 3D skin printer that deposits layers of skin tissue to cover and heal deep wounds. The size of a small shoebox, the device weighs less than a kilogram and functions like a white-out tape dispenser that deposits thin sheets of skin tissue. Milica Radisic, a professor in the department of chemical engineering who is the Canada Research Chair in Functional Cardiovascular Tissue Engineering, and Aaron Wheeler, a professor in the department of chemistry who is the Canada Research Chair of Bioanalytical Chemistry, will also play key roles in the CRAFT collaboration. Radisic has developed an injectable patch, which can be seeded with heart cells from a patient’s own body, to repair tissues damaged during a heart attack without resorting to open-heart surgery. Wheeler’s team, meanwhile, has developed a portable “lab-on-a-chip” diagnostic platform that brings the power of a diagnostic laboratory into the field, where it was used to gauge the level of immunity to vaccine-preventable diseases in remote regions of Kenya. Yet all of these technologies currently exist as prototypes only. Getting them ready for clinical application will require significantly ramping up production. Hence, the vision for CRAFT is to create a leading-edge facility capable of bringing microfluidic technologies from lab-scale prototypes to commercially viable products. To get there, microfabrication equipment from the three U of T labs will be consolidated and expanded with new machines capable of manufacturing thousands of units. Graduate students and researchers from U of T and its partner hospitals will work alongside NRC scientists and technologists with experience in the development of medical devices. They will also draw extensively on the expertise and manufacturing capabilities of NRC’s existing Medical Devices Research Centre in Boucherville, Que. NRC has deep expertise working with the unique materials needed to construct microfluidic devices at scale. “Many researchers build their prototypes out of a material called polydimethylsiloxane (PDMS),” says Radisic. “It’s easy to work with in the lab, but it absorbs small molecules, including drugs, which means we can’t use it for the commercial versions. NRC scientists know how to make devices from other thermoplastic elastomers that don’t absorb small molecules. Guenther expects that over the next five years, CRAFT will spawn a number of spinoff companies. He also emphasizes that collaboration – between researchers, technologists and clinicians – will be key to CRAFT’s success. “This will be an open facility, accessible to everyone who is working in this technology space,” says Guenther.